Country gardens have a soft planting feel to them. You may be under the impression that this is difficult to create without the help of mature planting, however, even if you’re just starting out with landscaping a blank space, you can soften the look of your garden with foundation planting. Foundation planting is the process of planting at the base of buildings, walls, pergolas and other hard structures. By doing this, it creates a softer boundary between the hard and soft landscaping, which will give a pretty overall effect. 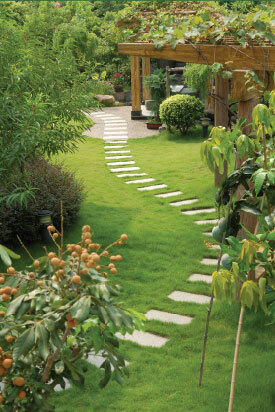 Of course, you will need some structure within your landscaping. It’s important to have plenty of informal planting – areas of wild meadow flowers, for example, are ideal – but combine this with more formal planting to stop your garden from looking unkempt. For example, add yews and hedges, and frame these with long grasses and flowering perennials. Obviously all gardens need a certain amount of functional elements, such as patios and pathways, but make sure that these are in keeping with the rest of your garden. In a country garden, all functional elements should also be pretty. Therefore, consider what materials you’ll use for your hard landscaping – rustic materials such as brick work well over contemporary elements – and think about the likes of climbing plants to soften any tall structures. A simple way to add a touch of country garden to any space is to add a kitchen garden. Herbs and edible plants can be grown in pots, so you don’t need a huge space to create a kitchen garden. Again, stick to shabby chic pots and containers and then choose the likes of chives, basil, strawberries and nasturtiums to grow and eat to your heart’s content! If possible, add a water feature to your country garden. It’s a lovely focal point in any outdoor space, but once again really softens the look and feel of landscaping. A pond will support many different species of plants and wildlife, but if you haven’t got the space to turn over to a large area of water, then just add a small feature which can be nestled in amongst your planting. If you’d like to be in an English country garden this summer, why not get in contact with D&G Garden World? We will happily add an English country garden feel to your home, regardless of whether it’s a cottage or a castle!